The expanded 2000 point Force Organisation Chart has been a sticking point for many, as it inevitably was going to be. By this point, many people have wailed on it from the gamer's perspective, and so I feel like it is now my turn to do this. Wail. Wail wail. Wail wail wail. There, I feel much better. Now to look at it from a design perspective. After the jump. It's good, lengthy and has a snazzy diagram. First off, we need to determine the reasoning behind the decision. In this case, the reason is easily determined. It is the fact that having a strict set of guidelines on what can be included in an army is going to get limiting the further up one goes, a very valid point. There are already ways to alter the Chart, by way of making certain units occupy different slots, but this only goes so far to address the limitations. If we applied the tried and tested idea of Occam's Razor, ie. the simplest solution is probably the best one, expanding the very thing that controls army construction comes out in front. 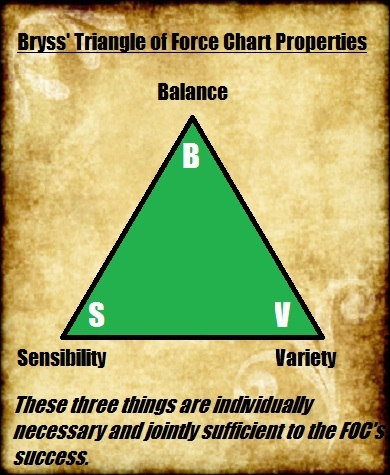 However, and this is what I believe GW has forgotten, the Force Chart is more than just a set of parameters. Below is my idea of what the FOC aims for, expressed in a rather pretty and philosophical diagram. Balance ensures that the Chart can face off against different permutations of itself without one side having a large advantage. Sensibility is seen through the 1 HQ, 2 Troops rule. It ensures that a logical foundation lies at the heart of every army, rather than just a random pile of models. Variety ensures that each slot is made of slightly different models, rather than every slot containing the same thing, and that most armies you face are not just one unit over and over, making for a duller game. It seems clear to me that the double FOC attacks all of these properties to different degrees. It attacks balance by making ludicrously lopsided lists possible, as any competitive blog has probably already tried. This same thing is an attack on variety too, as more and more 2000 point list combinations include six Elites, or six Heavies, etc, and the 'borderline' choices that people included because they were alright but not quite up there with the best units will be dropped. You may be wondering where sensibility comes under attack. It's easy, really. At 2000 points, there is a 95% chance that your list will have 2 HQs and at least 4 Troops. Therefore, making it compulsory to purchase a second 'core' of 1 HQ and 2 Troops is like making the consumption of food three times a day a necessary legal requirement. We were doing it already, therefore the second core does nothing and isn't sensible at all. Because of this, the expanded chart may as well have no core, and therefore it seems like 1.75 charts rather than 2. Now, another option GW could have taken is making the second chart a reward for maxing out your first chart before hitting 2000 points. But I'm not going to say that's the solution, because people will complain that armies with no good options in certain slots are taxed, and there won't really be many points left for more new stuff from the good ones. It doesn't work, end of. But here's a thought. If we apply Occam's Razor from paragraph 5 again, and we say that the reason the double FOC doesn't work is because it's too much, the simple thing to do is shorten it. GW has even given us a starting block, in the form of a Combat Patrol chart or similar. With this in mind, I'll end with a suggestion. This may work, it may not, but it's certainly a lot less heavy-handed than the GW method. Because, frankly, most armies don't need a leg up to reach 2000 points properly. 2500 is a little harder. Ensuring no mass investment in one slot helps preserve balance and variety, and not doing at 2000 points is sensibility. Until next time. Useless Trivia: Without fail, every time I try to spell 'sensibility', I miss out the last 'i.' What's wrong with me? These are my thoughts exactly on a much better way to expand larger games. Do it in increments just as you are suggesting. Much better than just a flat double at a certain point value. GW devs build this game for a living. Therefore, it's unlikely that they've "forgotten" anything about it. So, your conclusion... not the simplest, most direct one. No, I think Occam's Razor is that GW simply things 2,000 points is an unnaturally large points size. They're 2° away from explicitly saying that if you're playing the game with 2,000 points on the table you're doing something inherently unusual. The question shouldn't be "should I use an extra force org at 2,000 points," it's "should I even be playing at 2,000 points to begin with?" However, if they do indeed write this game for a living, looking at lists on their site,WD, etc., I still see a lot of wiggle room even with one chart. So perhaps everyone's making logical leaps all over the shop. And need I mention that this article didn't even consider Allies? Why would GW give you +6 slots to the normal, 1999 or less chart if they didn't want you to build bigger. This comment is too big. A sequel article is clearly warranted.